Harold McDowell, 85, won $1 million with a rare poker hand at the Borgata Hotel Casino & Spa in Atlantic City. A retired Lakewood man got the Christmas gift of a lifetime on Saturday afternoon at the Borgata Hotel Casino & Spa. 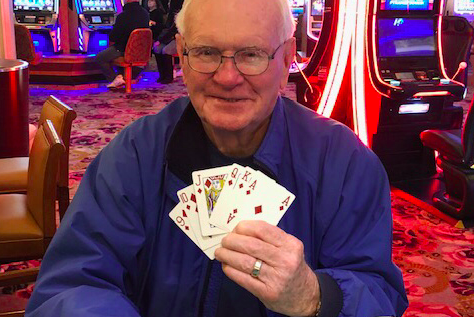 Harold McDowell, 85, visited the casino with his wife over the weekend and put down $5 on the Three Card Poker "Six Card Bonus" bet. With a 10, a queen and the ace of diamonds in his hand, the dealer handed him the nine, jack and king of diamonds. It was a royal straight flush of diamonds. Borgata officials checked with experts at wizardofodds.com and confirmed that the odds of getting McDowell's hand are 1 in 20,348,320. This was the first time that bet has hit at the Borgata. McDowell told The New York Post he was in shock when he won. McDowell's wife, who had been battling cancer in recent years, had received a clean bill of health the day before their trip to Atlantic City. McDowell said he plans to give most of the money to his children.